I don’t know if I can even call this a recipe. It was a blatant, outright culinary mistake that yielded something delicious and kind of special. And when that sort of thing happens, is it really right to keep it to myself? See, I don’t really know a whole lot about making frosting. Or icing. Or whatever you want to call it. I mean, I know that if you mix milk with confectioner’s sugar, you can create a glaze. I know that you can sweeten cream cheese and beat it into fluffy submission. But the whole frosting thing is just not something I do all that often. I take the shortcut with sugary crusts. But I was making a cake. And I wanted a very special, very specific kind of frosting for this cake. 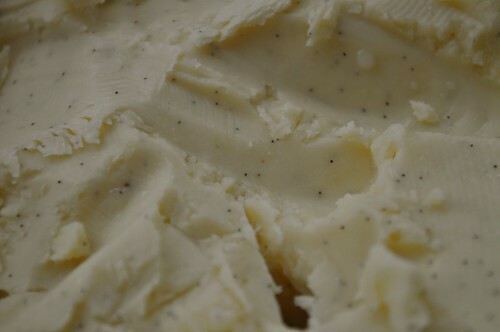 In my mind, I was dreaming up an airy, buttery, vanilla bean-flecked delight. It seemed to make sense to me that if I creamed some butter and sugar, I could add heavy cream and continue to beat it until it was somewhere between a light whipped cream and thick buttercream. I’m still reasonably sure this is possible (I don’t know for sure because I switched off to mascarpone for round two, just to be on the safe side). I had one of those moments, though, where I completely forgot myself. I combined the butter and sugar, added the heavy cream, grabbed my hand mixer and I let ‘er rip. Show of hands, anyone know what happens when you overbeat whipping cream? Almost immediately it started to look curdled. Well, surely if I keep beating it, thought I, it will smooth out all those tiny little butter lumps and turn into a pretty portrait of fluffy frosting. Not so much. As I continued to move the mixer around the bowl, the curdled white cream turned into thick yellow crumbles and I began to hear liquid sloshing at the bottom of the bowl. Damn it. Butter. Those who raised their hands for butter get a gold star. For half a second I felt defeated. I knew better. And then I began to laugh. I stood there, shaking my head and cracking up at myself as I turned toward the sink, holding back the butter with a spatula, letting the buttermilk drain. I reached into a drawer, pulled out my last square of cheesecloth, and wrung out the fragrant, softball-sized round. So it wasn’t buttercream. It didn’t need to be a total loss. And it absolutely wasn’t. 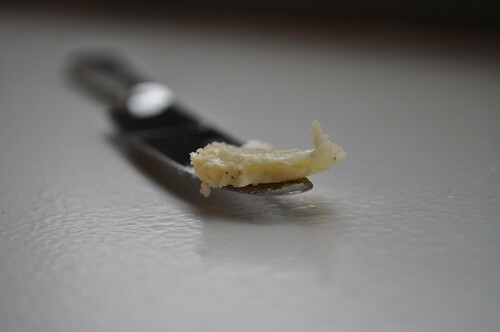 I slathered some of the vanilla bean butter on a slice of the test cake that I had baked that morning. Delicious. We’ve also since discovered that it is excellent on pancakes and I’d imagine it would be equally good on toast, muffins, or even banana bread. So, I’m going to share with you exactly what I did, because what came out of it all was pretty damned good. I’m sure there’s an easier way to make a vanilla infused butter, but if you follow this recipe I can guarantee that not only will you wind up with exactly enough to fill one of those plastic, pint-sized takeout containers, but you definitely won’t wind up with frosting. TIP: If I’d have had the forethought, I’d have packed it into jelly jars and given out a couple as gifts. Because I’m generous like that—and let’s face it, no two people need a whole tub of vanilla butter all to themselves. In a medium bowl, cream together the butter and sugar. Add the vanilla seeds and the extract and beat until well-combined. Pour in the heavy cream and beat as fast as you can without the cream splashing out of the bowl. Continue beating on high until the mixture curdles and separates into butter and buttermilk. Line a colander or sieve with cheesecloth and hold it over the sink. Turn the butter out into the sieve and drain thoroughly. Wrap the cheesecloth around the butter, forming it into a ball. Squeeze and wring out well. Remove the butter from the cheesecloth to a couple of paper towels. Pat off any excess moisture. At this point, you can either transfer the whole thing to a lidded, pint-sized tub or quarter it and transfer to four 4 oz. jelly jars. 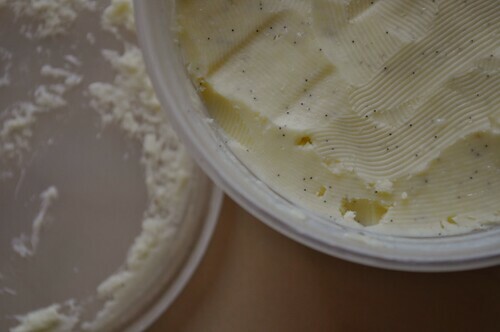 When packing it in your preferred container, make sure to press the butter in completely and work out any air bubbles along the bottom and sides. If little drops of excess buttermilk rise to the top while doing this, blot them with a paper towel. Cover, refrigerate, and use in tasty ways.